Wat doe je allemaal nadat je een Server gevirtualiseerd (P2V) hebt. 1. 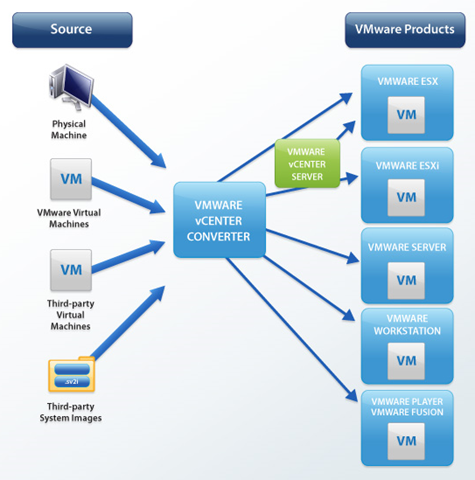 Installeer je VMware Tools. 3. Stop on nodige services die niet meer gebruikt worden. 7. Wanneer je “Device Manager” open hebt ga je naar View en kies voor Show hidden Devices. 8. Verwijder alles wat licht gekleurd is. Zo ontdoe je van alle oude hardware die tijdens de P2V mee genomen wordt. Nu krijg je de melding niet dat er op een andere netwerk adapter een IP is ingesteld. · Quickly and reliably convert local and remote physical machines into virtual machines without any disruption or downtime. · Complete multiple conversions simultaneously with a centralized management console and an intuitive conversion wizard. · Convert other virtual machine formats such as Microsoft Virtual PC and Microsoft Virtual Server or backup images of physical machines such as Symantec Backup Exec System Recovery or Norton Ghost to VMware virtual machines. · Restore VMware Consolidated Backup (VCB) images of virtual machines to running virtual machines. · Clone and backup physical machines to virtual machines as part of your disaster recovery plan.